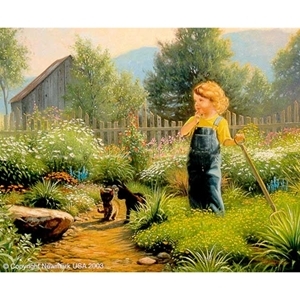 In this rendition of Little Gardener, I wanted to capture a young girl in her flower garden. The little gardener, while taking a break from her work is in deep thought contemplating on what tasks lie ahead. A gentle breeze coupled with the aroma of all the flowers in bloom can make even the most energetic of gardeners take a break to enjoy that special moment as a way of reaping the benefits of their labor of love.